SUMUR, BANTEN PROVINCE - A fresh eruption at the Anak Krakatau volcano that caused last weekend's deadly tsunami sent residents fleeing from the Java coastline on Tuesday (Dec 25) afternoon. Locals and officials alike in Sumur, among the areas worst hit by the tsunami, scrambled for higher ground after hearing a booming sound at about 2.40pm local time. Dr Sutopo Purwo Nugroho, a spokesman for Indonesia's National Disaster Management Agency (BNPB), told The Straits Times that the sound was caused by a fresh eruption of the Anak Krakatau volcano. Officials have said evidence suggested that an eruption at the rumbling volcano in the Sunda Strait - between Java and Sumatra - caused a section of the crater to collapse and slide into the ocean, triggering the tsunami on Dec 22. The tsunami struck at night and without warning. At least 429 people have been killed. Compounding the misery, pouring rains and mud-covered roads are slowing down rescue efforts in the remotest villages hit by Saturday's tsunami. Search and rescue teams managed to gain access to villages in Cigeulis and Sumur, both in Banten's Pandeglang regency, only on Monday. 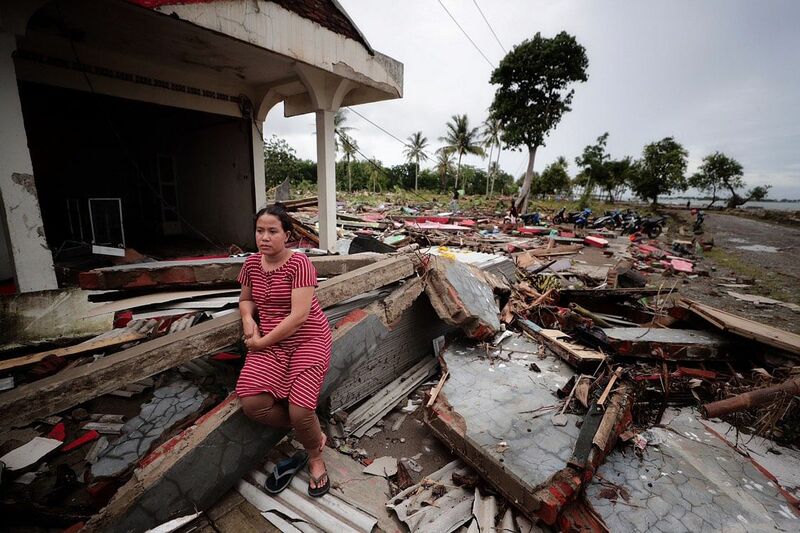 The two sub-regencies were the worst hit by the tsunami, which occurred at night without warning after a part of the Anak Krakatau volcano collapsed undersea. Damaged bridges and blocked roads had previously prevented rescuers, let alone excavators and heavy machinery, from reaching the villages. Rescuers, aid trucks and excavators finally arrived at many of the villages on Tuesday morning after taking detours, although some are still cut off. The car that took The Straits Times' journalists to the area had to go through a sandy beach to bypass a road cut off by a collapsed bridge, and then make its way through stone-strewn village roads. A group of about 10 residents in Cikujang village, in Cigeulis, were seen removing the rubble of a collapsed house by hand in search of a missing 14-year-old schoolgirl. Finding no signs of the child, the group then went on to a nearby creek and tried to clear a high pile of rubble. "We need an excavator," said Mr Nasan, a community leader in his 60s in Cikujang village. Of the village's 104 residents, five were killed and one remained missing. Most villagers had heard a roaring sound before the tsunami hit, and ran to a hill just across the road to seek refuge, said Mr Nasan. Mr Maskani, a 26-year-old resident, said his little sister Nur was the 14-year-old the villagers were trying to locate in the rubble. "I was building a chicken cage. My mother and wife were building the house roof out of coconut leaves. My father told me to check where a roaring sound was coming from. We thought it was different from the sound of a passing truck or from a boat engine," Mr Maskani told The Straits Times. He said his mother ran back inside the house to get Nur, but neither made it out in time. His father and his wife were injured while he himself was injured in the back and chest after being pinned between trees. Residents in Sumur Legon village in Sumur were luckier. The village was partially protected from the tsunami by two islets, one of which - Oar Islet - is a popular snorkelling spot. Fishermen packing their catch on the beach had also raised the alert that the tsunami was coming. The village did not suffer any deaths as a result. But still, residents were mourning the loss of their homes. Ms Tati Maryati, a 35-year-old mother of three, pointed to a flattened spot and told The Straits Times:"We have no house." She said she felt lucky that none of her family members fell victim to the tsunami. She recounted how she and her husband each swiftly carried one of their two youngest kids to higher ground as soon as they heard fishermen from the beach shouting "tsunami" repeatedly. "Our oldest son was at a night market about 1km from here. He was spotted seeking shelter on top of a coconut tree that night. People had to bring him down as he could not climb down the tree himself," Ms Tati said of her 12 year-old child. Thick ash clouds continued to spew from Anak Krakatau, a volcanic island where a crater collapse at high tide on Saturday, displacing a large volume of water and sending tsunamis smashing into coastal areas on both sides of the Sunda Strait between the islands of Sumatra and Java. At least 154 people remained missing, BNPB said on Tuesday. Nearly 1,500 people were injured, and more than 16,000 residents had to move to higher ground, with a high-tide warning extended to Wednesday. BNPB spokesman Sutopo Purwo Nugroho said on Monday night that a joint team of personnel from various government agencies and the military would evacuate most of the victims' bodies from remote villages by Tuesday. At least 36 bodies had been found in the villages of the Sumur sub-regency, Dr Sutopo said. The worst-hit Pandeglang regency boasts hotels and cottages frequented by mostly local tourists for the area's beaches, snorkelling and water sports. Holiday-goers also enjoyed seeing the magnificent Anak Krakatau volcano's occasional eruptions, with ash spewing and light glinting right above its crater. Indonesia is divided into 34 provinces, which comprise regencies and cities.